The New York Giants have signed cornerback Michael Hunter to reserve/futures contracts. The Giants originally signed Hunter as an undrafted rookie free agent after the 2016 NFL Draft. He spent time on both the team’s Practice Squad and 53-man roster in 2016. He also made the team in 2017 before being waived/injured in October 2017. The 6’0”, 192-pound Hunter played in six regular-season games for the Giants with no starts. Since leaving the Giants, Hunter has spent time with the New York Jets (2017), Denver Broncos (2017-2018), Buffalo Bills (2018), and Houston Texans (2018). He did not play in a regular-season game for any of those teams. The Pro Football Writers of America (PFWA) has honored three New York Giants for their performance during the 2018 NFL season. PFWA named running back Saquon Barkley “2018 Offensive Rookie of the Year.” In addition offensive guard Will Hernandez was named to the PFWA All-Rookie Team and place kicker Aldrick Rosas was named to PFWA’s All-NFC Team. The New York Giants have reinstated cornerback Dominique Rodgers-Cromartie, who was suspended without pay by the team last Thursday for violating team rules. According to media reports, Rodgers-Cromartie was in trouble for leaving a team recovery session on October 6th, the sidelines during the Giants-Chargers game on October 8th, and the team facility on October 10th – all without permission. The Giants released a statement that said Head Coach Ben McAdoo spoke with Rodgers-Cromartie today before he was reinstated. To make room for Rodgers-Cromartie on the 53-man roster, the Giants waived/injured cornerback Michael Hunter, who injured his hamstring during the Giants-Broncos game on Sunday night. The Giants originally signed Hunter as an undrafted rookie free agent after the 2016 NFL Draft. Hunter spent time on both the Practice Squad and 53-man roster in 2016. Last Sunday against the Denver Broncos, Roger Lewis, Jr. and Tavarres King were the only Giants wide receivers to catch a pass – and they had one reception apiece. It was the first time no Giants wide receiver had more than one catch since December 24, 2006, when Plaxico Burress, Tim Carter, and Sinorice Moss each had one in a 30-7 loss to New Orleans (when the Giants had 59 net passing yards). According to the Elias Sports Bureau, the victory in Denver was the first Giants game in which their wide receivers totaled no more than two catches since September 22, 1991, when Mark Ingram and Odessa Turner each had one catch in a 13-10 victory against Cleveland. Since the 1970 merger, the Giants are 18-2-1 when their opponents throws 50 or more passes. The game in Denver was quarterback Eli Manning’s 50th start in October. The Giants are 36-14 (.720) in those games. On Sunday, the Giants wore a “14” sticker on their helmet in honor of Hall of Fame quarterback and Giants record-holder Y.A. Tittle, who passed away last week. The sticker will remain on their helmets for the remainder of the season. The Giants return to practice on Wednesday. Wide receiver Odell Beckham, Jr. (ankle) and linebacker Keenan Robinson (concussion) did not practice on Thursday. Fullback Shane Smith (quad), wide receiver Tavarres King (ankle), defensive tackle Jay Bromley (knee), cornerback Eli Apple (ankle), and cornerback Michael Hunter (concussion) fully practiced. Head Coach Ben McAdoo and select position coaches and players will address the media on Friday. There is no media availability on Saturday. The Giants play the Dallas Cowboys in Texas on Sunday night. 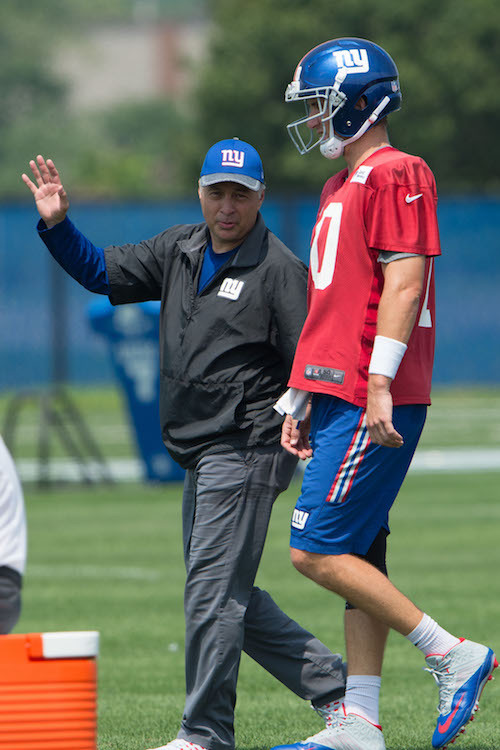 The New York Giants held their third summer training camp practice on Sunday at Quest Diagnostics Training Center in East Rutherford, New Jersey. 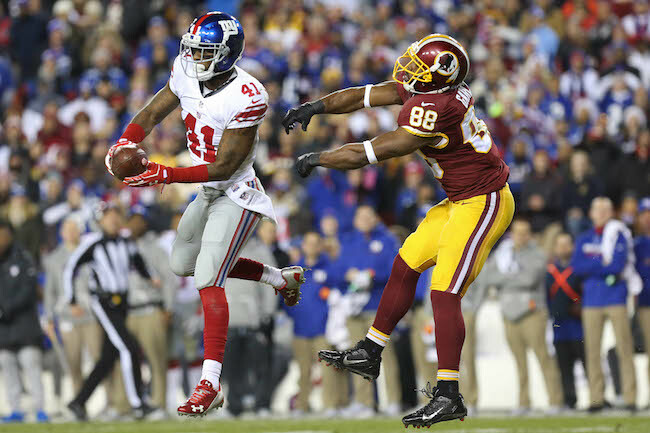 The Baltimore Ravens have signed New York Giants unrestricted free agent Larry Donnell. The Giants had no interest in re-signing Donnell, who began the 2016 season as the starting tight end but was benched after the bye week. He started to receive more playing time again late in the season. Donnell ended up playing in 14 games with six starts, and finished the regular season with just 15 catches for 92 yards (6.1 yards per catch) and one touchdown. Donnell originally went undrafted and unsigned in 2011. The Giants signed him as a street free agent in March 2012 and Donnell spent the 2012 season on the team’s Practice Squad. Donnell has regressed since his breakout 2014 season (63 catches for 623 yards and six touchdowns). His numbers were down in 2015 (missing half the season with a neck injury) and down again in 2016. Picture Perfect day. 80 and sunny with no humidity. Very comfortable with no breeze. Another day of “full speed” 7-on-7 and 11-on-11 drills where the guys got to compete. For obvious reasons, the defense holds back a tad in congested situations but for the most part, we got to see these guys fight it out. I wanted to get some more attention on the defense today…but also got to see kicker Aldrick Rosas get four attempts in. Distance isn’t exact, but they were all roughly 30-40 yards I believe. We got to speak to him after practice as well, nice kid, very relaxed and calm. Laid back. A few interesting notes about him…he played in a National Championship Game (NAIA) for Southern Oregon in 2014. Tore his ACL in that game and even with two years left of eligibility, he turned pro. He spent the 2016 preseason with Tennessee and lost out to veteran Ryan Succop. NYG signed him in January and as of now, he is the lone kicker on the roster. I still don’t have much of an opinion on the fullbacks, and I won’t until later in the week after we them bang heads with the pads on. Initially I think Jacob Huesman is a slightly better athlete with more power coming from his legs. WR Kevin Snead is a guy that keeps jumping out at me. Besides Odell Beckham, he has the best burst and short area change of direction of all the WRs. At 5’10/175, he is fighting an uphill battle but the UDFA from Carson Newman offers ability that his fellow backups do not. Remember, this is a guy that was clocked sub 4.25 at the Tennessee pro day, that is Jon Ross-caliber. If he can prove to be a factor on special teams and improve underneath route running, don’t overlook his chances. I put the eyeball on OT Jarron Jones today. Massive and yes, likely better built for the OT position than DT. Obviously he has a ways to go. Naturally his hands are way too wide on contact with his man and I can see there is a lot of struggle for him to avoid over-leaning and lunging. I’m curious to see if he even gets looks during preseason at OT, just doesn’t look ready but we will find out more Tuesday. The TE battle is as entertaining to watch as any spot on the team. Matt LaCosse has impressed me each day with his ball skills. Such a natural receiver that can grab and turn upfield with more than enough fluidity. Can he hack in the trenches? Jerell Adams is a second-year draft pick and his upside alone is worth keeping him around. But I’ve seen him trip over his own feet a few times and there doesn’t seem to be the natural player in him. That said I think he may be further along as a blocker than everyone other than Rhett Ellison. Speaking of Ellison, I like how he moves after the catch. Strong, powerful, aggressive, low to the ground. He may factor there. Evan Engram…man he’s fast. When he opens up his stride in space he is faster than most of the WRs. Another name I’ve been drawn to all three days is the UDFA RB Khalid Abdullah. Powerfully built, fast in the open field, assertive change of direction with all the balance and body control. NYG has a crowded backfield in front of him but hey, you never know when it comes to injuries. I can’t wait to see him carry the ball in preseason games. QB Davis Webb got some extra 7-on-7 work with the 3rd string. He looks the part, shows excellent lower body technique. Throws a very tight ball. Linebackers were my main focus early on. I’m saying this right now, B.J. Goodson is gonna be a guy we all like. He, more than anyone, is drooling at the thought of getting the pads on. In drills where these guys were working on taking on and shedding blockers, he was the only one that got off the dummy pad and physically wrapped up the coach acting as the RB. He is a quick, explosive, powerfully-built kid. LB Curtis Grant has really stood out to me athletically. He and Deontae Skinner play very fast…maybe even too fast for their own good. Athletically they are very impressive and the attention Antonio Pierce gave them today will hopefully provide needed progress from a skill perspective. DT Robert Thomas: He is still getting the first-team looks next to Damon Harrison. They are both high energy and play low to the ground. Stout, powerful, hard to move and they are both quick enough to penetrate. I am sticking with my prediction of him being the week 1 starter. I don’t want to over step any boundaries when it comes to discussing formations…but I saw a few things the way these guys lined up today I haven’t seen before. I like the idea of different fronts that play to these guys’ strengths. This DL as a whole really is deep and versatile. It looks like Owamagbe Odighizuwa is on the bottom looking up, but I could be wrong there. As a player, he seems manufactured. Good athlete, great frame but he lacks some of the twitchiness and feel that these other guys have. Landon Collins looks studly so far. He made an EXCELLENT, high-level pass break up on a pass from Eli Manning to Odell Beckham (I believe). He can make those 5-7 yard breaks out of his backpedal as fast as anyone. Instincts are a major plus for him, arguably the most important part of playing safety. LB Keenan Robinson has a more natural feel in coverage than the other LBs. He makes quick decisions and he simply just looks more comfortable whether he is moving laterally or vertically. He will have an important role within this defense despite not being one of the starters. LB Mark Herzlich is Mr. Team Player and I think this NYG coaching staff wants this guy around the team in the worst way. Solid backup inside LB, excellent special teamer. Even saw him run a few routes as a TE and caught a ball on the move in the flat from Webb. If he actually offers depth on all three phases, he’s a lock to make this team. LB Stansly Maponga looks a little out of place as a LB. When it comes to drills, he is often the one looking most uncomfortable and I don’t think he can factor in coverage. CB Michael Hunter. Excellent day for the long, speedy cover man. Hunter played physical at the point of attack but also showed more fluidity as he mirrored some of the backup WRs. He made two outstanding reach around pass deflections. We all know these #4 and #5 CB spots are up for grabs. Yesterday Donte Deayon stood out; today it was Hunter. I think Hunter offers a ton of upside and could be a much needed backup for the outside spots. CB Eli Apple. I’ve noted him a few times for his athletic prowess. Just an excellent package of size, speed, and strength. He was challenged a few times in team drills and he made a few excellent plays on the ball, two times were on deep throws to Beckham. Apple stayed in his hip pocket from start to finish. QB Josh Johnson. While he has the upper hand on experience with the scheme in comparison to Geno Smith, Johnson appears to be cementing himself as the team’s top backup. He is very consistent. Throws a great ball, very accurate, excellent touch. He makes life easier for the pass catchers. He just seems much more fluid than Smith but Smith does deserve a little handicap considering he is still new to the scheme and surroundings. In addition, below is the video link to our surface level notes, interview with kicker Aldrick Rosas, and clips from practice! We were missing a mic, so we had to pass the one back and forth…sorry for the crackling. Place kicker Aldrick Rosas went 3-for-4 on his field goal attempts (reporters said he went 4-for-4 but an official said he missed his last kick, which was from 45 yards out). Quarterback Josh Johnson was the second-team quarterback on Sunday. He and Geno Smith appear to alternating each day at the #2 spot. In 7-on-7 drills, wide receiver Roger Lewis beat cornerback Michael Hunter deep down the left sideline. Quarterback Geno Smith badly overshot tight end Matt LaCosse, who had beaten linebacker Deontae Skinner. Wide receiver Tavarres King made a sliding catch in front of cornerback Eli Apple. Quarterback Eli Manning then just missed King deep, who was well-covered by Apple. Wide receiver Travis Rudolph saw some reps with the second-team in the slot position. Wide receiver Odell Beckham, Jr., wide receiver Brandon Marshall, and tight end Evan Engram all scored in red-zone drills. Cornerback Eli Apple knocked down a deep post pass from quarterback Eli Manning to wide receiver Sterling Shepard. 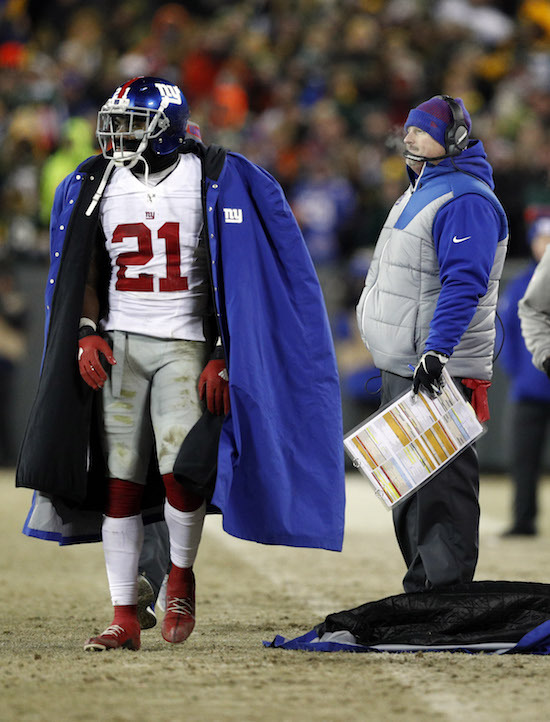 Apple then had blanket coverage on wide receiver Odell Beckham, Jr. deep, who Manning overthrew. Safety Landon Collins knocked away quarterback Eli Manning passes intended for tight end Evan Engram and wide Odell Beckham, Jr.
Cornerback Michael Hunter deflected a quarterback Geno Smith pass that safety Nat Berhe picked off. Defensive back Mykkele Thompson broke up a quarterback Davis Webb deep pass to wide receiver Kevin Norwood. Quarterback Davis Webb threw a pass to linebacker/tight end Mark Herzlich. The transcript of Ben McAdoo’s press conference on Sunday is available in The Corner Forum while the video is available at Giants.com. The fourth training camp practice will be held on Tuesday, starting at 10:55AM. The training camp schedule is available at Giants.com. 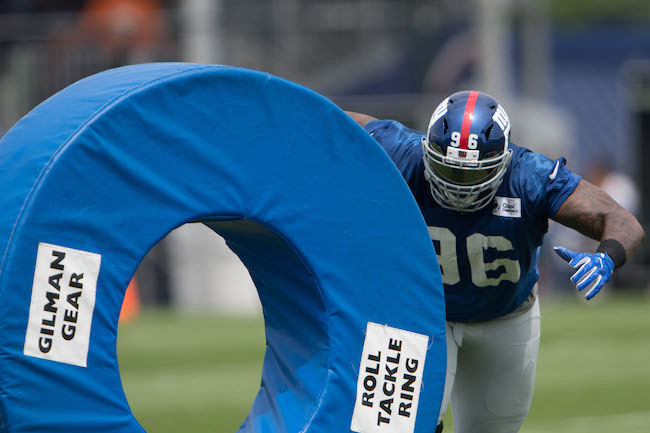 Articles, Training Camp Tagged with: Aldrick Rosas, Ben McAdoo, Brandon Marshall, D.J. Fluker, Donte Deayon, Evan Engram, Jadar Johnson, Jonathan Casillas, Landon Collins, Larry Donnell, Michael Hunter, Nat Berhe, Odell Beckham Jr.
2016 YEAR IN REVIEW: The biggest reasons for the New York Giants defense’s dramatic improvement in 2016 was the improved play of the (1) defensive line and (2) defensive backs. The Giants defense went from dead last in 2015 to tenth in yardage allowed and second in scoring allowed in 2016. And while the team’s 23rd-ranked pass defense (251.1 yards per game) does not sound impressive, the unit played at a far higher level than that, as indicated by three defensive backs earning All-Pro honors. 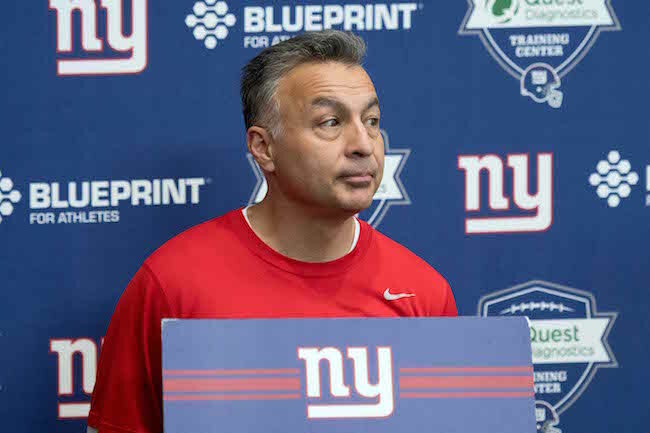 The secondary became a team strength because the Giants signed Janoris Jenkins in free agency, drafted Eli Apple in the first round, and watched second-year safety Landon Collins develop into an impact player at his more natural strong safety position. An inconsistent player in St. Louis, Jenkins became one of the best corners in the NFL in 2016, teaming with Apple and Dominique Rodgers-Cromartie (DRC) to form perhaps the NFL’s best trio of corners. While Apple had his growing pains, he performed well enough to shut down a number of opponents and allow the coaches to move DRC to the slot corner position. Meanwhile, Collins led the Giants in tackles, was second on the team in interceptions, and third on the team in sacks. The weak spot in the secondary was free safety as promising rookie Darian Thompson and Mykkele Thompson were lost early to injuries, Nat Berhe battled concussions, and undrafted rookie Andrew Adams started the bulk of the season. While Adams didn’t embarrass himself, he did not make many plays either. Late in the season, Leon Hall – who was shifted from corner to safety – took over the position. ADDITIONS/SUBTRACTIONS: The Giants chose not to re-sign CB/S Leon Hall and CB Trevin Wade. The Steelers signed CB Coty Sensabaugh. The Giants signed unrestricted free agents CB Valentino Blake and S Duke Ihenacho and re-signed practice squad players CB Michael Hunter, CB Donte Deayon, and S Ryan Murphy. The Giants surprisingly did not draft a defensive back in a DB-strong draft. But the team did sign undrafted rookie free agents CB DaShaun Amos, CB Nigel Tribune, S Jadar Johnson, and S Trey Robinson. TRAINING CAMP STORY LINES: At cornerback, while fan focus will be on the depth situation after the top three cornerbacks, the main story line will be determining Eli Apple’s upside. He had a solid but not great rookie season. If he can elevate his game to a different level in 2017, then the Giants defense will be very tough. The Giants do need to determine their #4 and possibly #5 corners. Injuries happen. When Rodgers-Cromartie left the playoff game, the Packers picked on his replacement. With Leon Hall, Trevin Wade, and Coty Sensabaugh gone, someone else will have to step forward. At safety, can Landon Collins duplicate or even build upon his 2016 All-Pro season? Much attention will be focused on who starts at free safety opposite of Collins. Darian Thompson is coming off a serious lisfranc injury. Nat Berhe and Mykkele Thompson have not been able to stay healthy. “Veteran” journeymen Duke Ihenacho, Eric Pinkins, and Ryan Murphy will battle Andrew Adams and the two rookie free agents (Jadar Johnson and Trey Robinson). There are a lot of bodies, but also a lot of questions. ON THE BUBBLE: Everyone except for Janoris Jenkins, Eli Apple, Dominique Rodgers-Cromartie, Landon Collins, and probably Darian Thompson. PREDICTIONS: This is arguably the most-talented group of defensive backs accumulated at one time in team history. Most of the question marks here surround health and depth. The Giants top three corners are as good as anyone in the NFL. Two are already playing at an All-Pro level. Look for Eli Apple to elevate his game and make this unit even stronger. As long as his foot is OK, Darian Thompson should start at free safety and give the Giants a very formidable (and intelligent) secondary. Special teams will be a big factor in determining the back-up corners and safeties. 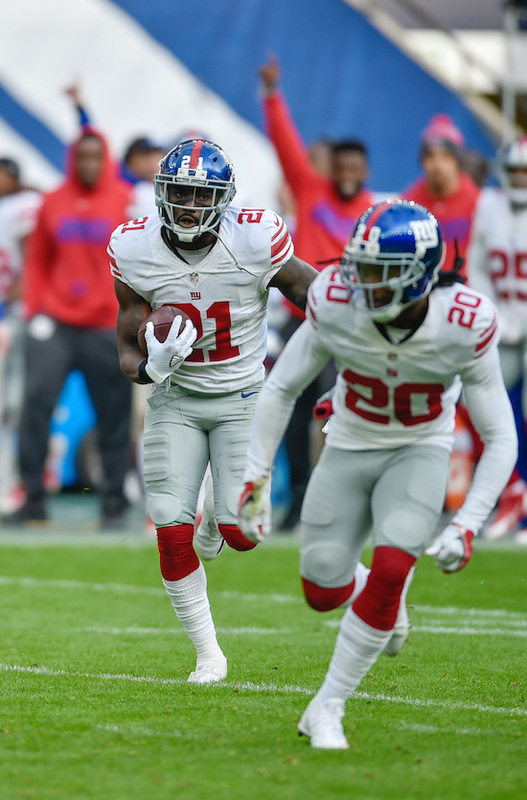 FINAL DEPTH CHART: Janoris Jenkins, Eli Apple, Dominique Rodgers Cromartie, Michael Hunter, Mykkele Thompson, Landon Collins, Darian Thompson, Andrew Adams, and Jadar Johnson. (Thompson can play both safety and cornerback, which helps his cause. Beat writers think special teams ace Eric Pinkins has a good shot – keep an eye on him. 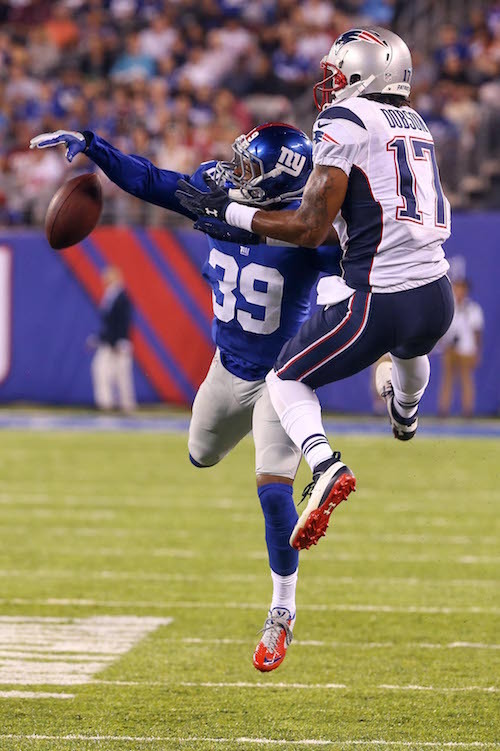 Donte Deayon is a favorite of Steve Spagnuolo). The biggest reasons for the New York Giants defense’s dramatic improvement in 2016 was the improved play of the (1) defensive line and (2) defensive backs. The Giants defense went from dead last in 2015 to tenth in yardage allowed and second in scoring allowed in 2016. And while the team’s 23rd-ranked pass defense (251.1 yards per game) does not sound impressive, the unit played at a far higher level than that, as indicated by three defensive backs earning All-Pro honors. In his first season with the Giants, Janoris Jenkins had his best season to date, being voted to his first Pro Bowl and his first All-Pro (second-team) selection. Jenkins started every game, except for missing one game due to a back injury, and finished the season with 49 tackles, one sack, 18 pass defenses, three interceptions, and one forced fumble. Jenkins was originally drafted in the 2nd round of the 2012 NFL Draft by the St. Louis Rams. The Giants signed him as unrestricted free agent in March 2016. Jenkins is an average-sized corner with excellent speed and quickness. He is a confident, instinctive coverman who has gotten better each year and has developed into an elite shut-down corner. Jenkins plays well in both man and zone coverage. He plays with swagger. The Giants drafted Eli Apple in the 1st round of the 2016 NFL Draft. He missed two games with hamstring and groin injuries, but surprisingly started 11 of the 14 regular-season games he played in. Apple finished the season with 51 tackles, seven pass defenses, one interception, and one forced fumble. Apple combines good size with excellent overall athletic ability, speed, and quickness. He flashes as a physical run defender and tackler, but needs to become more consistent in that area. Apple had a bit of an up-and-down rookie season in coverage. While he mostly handled his opponent, there were times when he gave up big plays. Apple makes a lot contact with receivers in coverage and he needs to continue to work on his technique. He has a big upside and looks to be developing into a fine player. Dominique Rodgers-Cromartie (DRC) had another strong year for the Giants, being named second-team All-Pro. He missed one game with a groin injury but started nine of the 15 regular-season games he played in, taking most of his snaps inside at the slot corner position. DRC finished the year with 49 tackles, one sack, 21 pass defenses, six interceptions, and one forced fumble. Rodgers-Cromartie was originally drafted in the 1st round of the 2008 NFL Draft by the Arizona Cardinals. He was traded to the Philadelphia Eagles in 2011 and signed with the Broncos as an unrestricted free agent in 2013 and the Giants in 2014. Rodgers-Cromartie combines superb size and overall athletic skills, including speed, size, and leaping ability. Rodgers-Cromartie is one of the better cover corners in the NFL and capable of shutting down even top wide receivers. He has improved his toughness as a hitter and tackler. Rodgers-Cromartie made the Pro Bowl in 2009 and in 2015, the latter as an alternate. While he has not missed many games, DRC seems to battle a lot of nagging injuries. 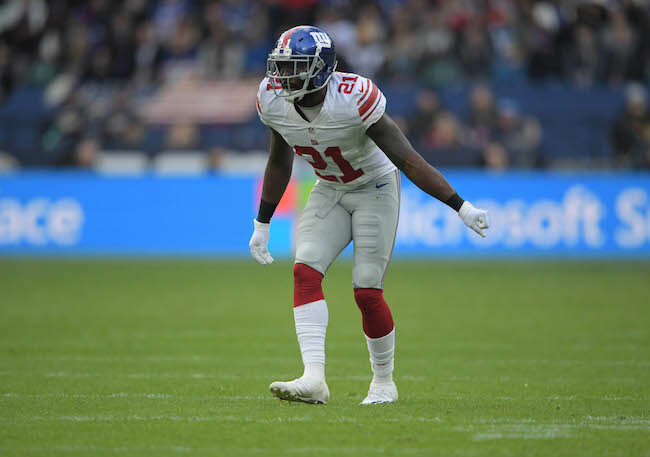 In his second season, Landon Collins had a break-out year, being voted to his first Pro Bowl and first-team All-Pro. Collins started every game and finished the year with 125 tackles, four sacks, 13 pass defenses, and five interceptions. Collins was drafted in the 2nd round of the 2015 NFL Draft by the Giants. He is a big, tough, physical safety who lacks ideal quickness and recovery speed. Collins is good hitter and tackler and plays the run very well. He dramatically improved his play against the pass in 2016 and has rapidly developed into one of the best safeties in the NFL. The Giants originally signed Andrew Adams as an undrafted rookie free agent after the 2016 NFL Draft. Adams was signed to the Practice Squad, and then the 53-man roster in September 2016 after injuries hit the safety position hard. Force-fed into the starting line-up, Adams played in 14 regular-season games with 13 starts. He finished the year with 46 tackles, five pass defenses, and one interception. Adams lacks ideal height and speed but he is a well-built, athletic safety with good quickness. While Adams failed to make many plays on the ball in coverage, he was surprisingly reliable in that opposing offenses did not exploit him as much as would have been expected. That said, Adams saw his playing time decrease at the very end of the season in favor of Leon Hall. Trevin Wade played in every game in 2016 with two regular-season starts. He received about 33 percent of defensive snaps and finished the year with 26 tackles and three pass defenses. Wade was originally drafted in the 7th round of the 2012 NFL Draft by the Cleveland Browns. He has spent time with the Browns (2012-13), Saints (2013-14), and Lions (2014). The Giants signed Wade to a reserve/future contract in January 2015. Wade is a decent-sized corner with only average athletic ability and speed. He can handle the slot corner position. Wade flashes solid cover skills at times but also gives up a fair share of completions. Coty Sensabaugh was signed by the Giants in October 2016 after he was waived by the Los Angeles Rams. He played in 10 regular-season games with no starts and finished the year with 15 tackles. Sensabaugh was originally drafted in the 4th round of the 2012 NFL Draft by the Tennessee Titans. 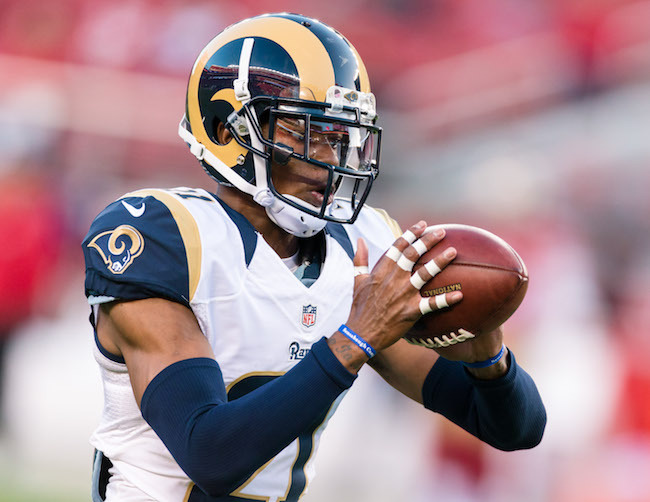 The Rams signed him to a 3-year, $15 million contract in March 2016. Sensabaugh has played in 72 regular-season games with 29 starts. Sensabaugh is an average-sized corner whose strength is playing the slot nickel corner spot. The Giants signed Leon Hall in August 2016. The Giants started him off at his usual slot corner position before shifting him to safety when injuries hit that position hard. Hall played in 12 regular-season games with two starts, finishing with 31 tackles, two sacks, two pass defenses, one interception, and one forced fumble. Hall was originally drafted in the 1st round of the 2007 NFL Draft by the Cincinnati Bengals. In his nine seasons with the Bengals, Hall played in 121 regular-season games with 105 starts. Hall is nearing the end of a productive career, but his corner cover skills have eroded due to father time and injuries (Achilles’ tendon injuries in 2011 and 2013 and back surgery in 2016). Hall’s final playing days may be best suited for safety. Michael Hunter spent time on both the Practice Squad and 53-man roster in 2016. He played in two regular-season games and finished the season with four tackles. The Giants originally signed Hunter as an undrafted rookie free agent after the 2016 NFL Draft. Hunter has a nice combination of size and speed. He is a physical, press corner who was up-and-down during the 2016 preseason for the Giants. Nat Berhe had his second injury-plagued season in a row in 2016. Berhe missed nine regular-season games with two concussions. He ended up playing in seven games with two starts, finishing with 21 tackles, one pass defense, and one forced fumble. Berhe was drafted in the 5th round of the 2014 NFL Draft by the Giants. He played in all 16 games as a rookie, mostly on special teams. But he missed all of 2015 due to a blood clot in his calf. Berhe lacks ideal size and speed, but he is a smart, physical, and aggressive defender who hits hard. The two concussions combined with his physical style of play cloud his NFL future. Eric Pinkins was signed to the Practice Squad in October and the 53-man roster in November. He ended up playing in five games, mostly on special teams. Pinkins was originally drafted in the 6th round of the 2014 NFL Draft by the Seattle Seahawks, who moved him to linebacker. Pinkins was waived by the Seahawks in September 2016. Pinkins has a nice combination of size and speed, but his instincts have been questioned. Ryan Murphy was signed to the Practice Squad in late December 2016. Murphy was originally drafted in the 7th round of the 2015 NFL Draft by the Seattle Seahawks. The Seahawks waived him in their final round of cuts in September 2015. He spent time on the Practice Squad of the Denver Broncos in both 2015 and 2016. Murphy has a nice combination of size and athletic ability. Donte Deayon was signed to the Practice Squad in September 2016 and placed on the Practice Squad/Injured Reserve in October 2016 with an unknown injury. The Giants originally signed Deayon as an undrafted rookie free agent after the 2016 NFL Draft. Deayon is a fluid, dimunitive corner with very good quickness and leaping ability. He is tough and confident, but struggled at times for the Giants during the 2016 preseason. Having won the starting free safety position in the preseason, Darian Thompson missed virtually the entire season after suffering a Lisfranc foot injury in Week 2. Thompson tried to return in November, suffered a setback in practice, and was placed on Injured Reserve. The Giants drafted Thompson in the 3rd round of the 2016 NFL Draft. Thompson has a nice combination of smarts, maturity, size, and overall athletic ability. Thompson has natural cover skills and makes plays on the football in coverage. It remains to be seen how much the lisfranc injury affects his career. Mykkele Thompson was placed on Injured Reserve in September 2016 after injuring his knee in Week 2. Thompson was drafted in the 5th round of the 2015 NFL Draft by the Giants. He missed all of his rookie season after rupturing the Achilles’ tendon in his right foot during the preseason. Somewhat still raw, Thompson is a former quarterback and wide receiver who converted to cornerback and then safety in college. Thompson is a bit of a corner-safety ‘tweener. He is tall and thin with good speed, but he lacks ideal quickness for cornerback and ideal physicality for a safety. Thompson is versatile and smart. He is a good special teams player who blocked three punts in college. With two serious leg injuries in his first two seasons, his NFL future is cloudy. All except Bowie were either on the team’s Practice Squad or Practice Squad/Injured Reserve (Deayon) at the end of the season. Bowie was originally drafted in the Seattle Seahawks in the 7th round of the 2013 NFL Draft. He played in nine games with eight starts as a rookie. 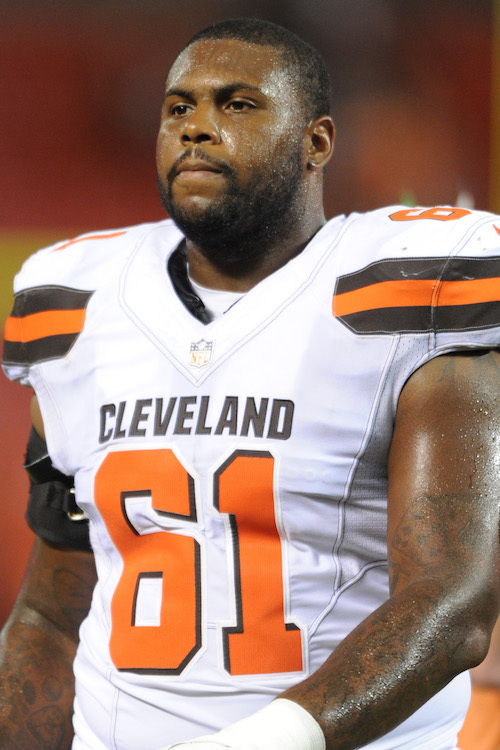 Bowie was waived in August 2014 and claimed by the Cleveland Browns. Bowie had shoulder issues in Cleveland and did not play in a regular-season game. The Browns placed him on the reserve/retired list in August 2016 and cut him in September. Bowie is a versatile lineman who has played both tackle and guard. He has very good size. The transcript of Jerry Reese’s press conference on Monday is available in The Corner Forum while the video is available at Giants.com. These nine players were either on the team’s Practice Squad or Practice Squad/Injured Reserve (Deayon) at the end of the season. The Giants did not score at least 20 points in any of their last six games (including five in the regular season), their longest such streak since September 22-October 26, 1980. They did not reach the 30-point mark in any of their 17 games. The Giants are 0-18 in postseason games in which they allow more than 21 points. QB Eli Manning played in his 12th career postseason game, the second-highest total in Giants history. LB Lawrence Taylor played in 15 playoff games. Cornerback Eli Apple (groin), safety Darian Thompson (foot), safety Nat Berhe (concussion), wide receiver/returner Dwayne Harris (toe), and offensive tackle Marshall Newhouse (calf) did not practice on Thursday. Defensive end Jason Pierre-Paul (groin), defensive end Olivier Vernon (wrist), cornerback Dominique Rodgers-Cromartie (groin), linebacker Devon Kennard (concussion), running back Rashad Jennings (thumb), and tight end Jerell Adams (ear) were limited in practice. Tight end Larry Donnell (concussion) fully practiced. The New York Giants have signed linebacker Eric Pinkins and cornerback Michael Hunter to the Practice Squad. To make room for these two, the team placed cornerback Donte Deayon on Practice Squad/Injured Reserve and terminated the Practice Squad contract of quarterback Logan Thomas. Pinkins was originally drafted in the 6th round of the 2014 NFL Draft by the Seattle Seahawks. Pinkins was waived by the Seahawks in September 2016. He has played in six regular-season NFL games with no starts. Pinkins has a nice combination of size and speed, but his instincts have been questioned. Hunter has spent time on both the Practice Squad and 53-man roster in 2016. The Giants originally signed Hunter as an undrafted rookie free agent after the 2016 NFL Draft. Hunter has a nice combination of size and speed. Deayon was signed to the Practice Squad in September 2016. The Giants originally signed Deayon as an undrafted rookie free agent after the 2016 NFL Draft. Thomas was originally drafted in the 4th round of the 2014 NFL Draft by the Arizona Cardinals. The Dolphins claimed Thomas off of waivers from the Cardinals in September 2015 and the Giants claimed him off of waivers from the Dolphins in June 2016. The New York Giants have signed cornerback Coty Sensabaugh (who was cut by the Los Angeles Rams on Saturday) and Deontae Skinner (who was on the Giants Practice Squad) to the 53-man roster. To make room for Sensabaugh and Skinner, the Giants waived defensive tackle Montori Hughes and cornerback Michael Hunter. The Giants also re-signed quarterback Logan Thomas to the Practice Squad. Sensabaugh was originally drafted in the 4th round of the 2012 NFL Draft by the Tennessee Titans. The Rams signed him to a 3-year, $15 million contract in March. Sensabaugh has played in 61 regular-season games with 29 starts. Sensabaugh is an average-sized corner whose strength is playing the slot nickel corner spot. Skinner was signed to the Practice Squad in September and October 2016. Skinner was originally signed as an undrafted rookie free agent by the New England Patriots after the 2014 NFL Draft. He has spent time with the Patriots (2014-2015) and Eagles (2015-2016), the latter waiving him on August 22. Skinner is a big, instinctive linebacker with decent agility but who lacks speed. The Giants re-signed Hughes in September 2016 after cutting him the week before. Hughes was originally drafted in the 5th round of the 2013 NFL Draft by the Indianapolis Colts. In his two seasons with the Colts, Hughes played in 16 games with one start. The Colts waived him in September 2015 and the Giants then signed him to their Practice Squad. The Giants signed Montori Hughes to the 53-man roster in November 2015. He ended up playing in seven games as a reserve, and finished the season with six tackles. Hunter was signed to the Practice Squad and later the 53-man roster in September 2016. The Giants originally signed Hunter as an undrafted rookie free agent after the 2016 NFL Draft. Thomas was originally drafted in the 4th round of the 2014 NFL Draft by the Arizona Cardinals. The Dolphins claimed Thomas off of waivers from the Cardinals in September 2015 and the Giants claimed him off of waivers from the Dolphins in June 2016. Thomas has only played in two NFL games, completing one pass in nine attempts for an 81-yard touchdown. The Giants return to practice at 11:40AM on Wednesday.